The recent successes of the Shia coalition in Syria, backed by Russian air force and special operations elements and the recent battle of Ramadi in Iraq, in late 12/2015, where American air power and Army advisers helper the Iraqi Shia based Army to seize parts of Ramadi shocked and alarmed the Sunni Arabs in the Middle East. In their prospective Shia forces, backed by Christian superpowers are making gains and advances against the Sunni majority of the region and the dominancy of Sunna in the Islamic world. Using the Islamic State as an excuse and the US-led coalition as a tool Saudi Arabia military spokesman Brig. Gen. Ahmed Asiri said, on Thursday 02/04/2016, the kingdom is ready to send ground troops to Syria to fight ISIS — an offer welcomed by American Defense Secretary Ashton Carter. 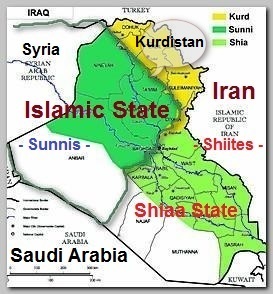 The Saudi idea is to establish a heavy Saudi military presence in the Sunni inhabited and predominated areas of Iraq and Syria in order to protect the Sunni population and to stop and contain the Shia forces from advancing into more Sunni territories. ISIS is a perfect excuse. The very same day Russia’s ministry of defence warned that Turkey is preparing a ground invasion of Syria. According to Reuters, defence spokesman Igor Konashenkov said there are “a growing number of signs of hidden preparation” for a land incursion by Turkish forces into its war-torn neighbour. Iranian official, of course, warned, on Friday 02/05/2016, against Saudi plans to send troops to Syria saying the region is on the brink of a major war. Mohsen Rezaei, Secretary of the Expediency Council, expressed his concern over Saudi Arabia’s intention to deploy ground troops to Syria, and predicted that in the case of confrontation between Russia, Turkey, Saudi Arabia and Syria and the US involvement, a ‘great regional war’ would be waged in the Middle East. The comment was made despite an alleged common interest of all parties involved to fight I.S.I.S. Saudi Arabia’s proposed troop deployment in Syria would be regarded as a declaration of war he said. Syrian Foreign Minister Walid Muallem warned Saudi Arabia not to send troops to his country, threatening, during a press conference Saturday 02/06/2016, that troops would be sent back home in coffins. Despite the warnings the United Arab Emirates (UAE), a close partner and ally of Saudi Arabia, said, on Sunday 02/07/2016, it too was ready to send ground troops to Syria as part of an international coalition to fight against the Islamic State of Iraq and Syria (ISIS) militant group. It is clear and obvious that the Sunni countries in the Middle East are weighing options how to protect the Sunnis in Syria, Iraq and Yemen. They are afraid for Russia and are looking for a good excuse, and excuse that will gain them the support of USA and I.S.I.S is a perfect excuse to establish a strong military presence in the Sunni areas of the Middle East. The recent move is a very risky step toward a regional all out religious war between Sunni and Shia, between Iran and Saudi Arabia, each side with its allies and affiliates.